Of all the education and training providers in the United States, community colleges and two-year technical colleges are in the best position to respond directly and quickly to the ideals of the School-to-Work Opportunities Act of 1994. The act promotes a systemic appreach to preparing a global workforce by establishing a framework within which states can create school-to-work systems. Community colleges are an important linchpin in the new paradigm. particularly as the neutral convener of the new collaborative and entrepreneurial partnerships, consortia, and coalitions that will be necessary. 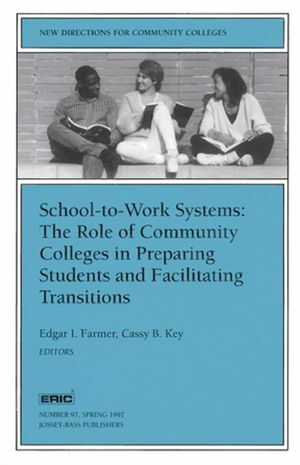 This issue demonstrates how community colleges are engaged in strengthening existing partnerships with schools, employers, and labor- and community-based organizations as they develop new programs to address the three major components of school-to-work systems. This issue will serve as a valuable resource guide for school-to-work practitioners as they build on these partnerships. This is the 97th issue in the journal series New Directions for Community Colleges. EDGAR I. FARMER is associate professor of workforce education and development at Pennsylvania State University. CASEY B. KEY is executive director of the Capital Area Tech-Prep/School-to-Work Consortium in Austin, Texas.